Today I have made a cute Ebay watches wishlist that are all under £10! These are inexpensive watches ranging in price from £1.69 to £9.19 that I think are cute, fun or pretty to be a great accessory to an outfit. Starting off my cute Ebay watches wishlist are these gorgeous black strap watches. These watches come with a range of designs – cat, top hat and tache, bow or moustache and are only £2.59 with free postage! Number 3 is a gorgeous brass studded watch that looks more like a bracelet than a watch. This watch has free postage and is only £3.50 and comes in a range of colours – brighten your outfit with yellow, red, green, blacks, browns and white. #4 is a watch I loved so much I had to buy it, can’t wait for it to come through the post! This moustache watch is stainless steel and I love the thin gold strap. I’m a sucker for any moustache products and this watch looks super cute at only £3.75 with free postage. Fifth is a fantastic watch at a total of £1.69! I love charm bracelets and know that many people don’t like wearing watches so this charm bracelet watch is perfect. Personally I would look for some of my own charms to add to this watch to personalise it. 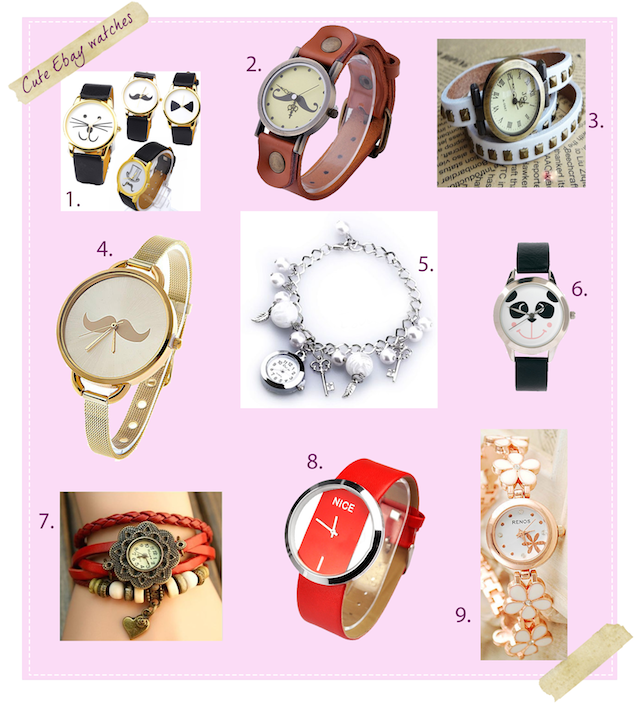 For £9.19 total I love number 6, the super cute panda watch. Pandas are one of my favourite animals and I love this design, it’s so fun and sweet. All the profits made by this Ebayer go gratefully towards their Rescue Animals as well. 7th is a gorgeous vintage wrap around watch. This watch is available in 6 colours and I loved the weave and beaded leather straps. This watch is adjustable and comes to only £2.99! I love number 8’s design, this minimal watch looks as though it is floating and looks so cool. It comes in white, red and black and looks so sleek, at only £1.88 total you cannot go wrong. Finally I have listed the multicoloured flower watch that is £5 total. It’s a pretty design and I love the flowery strap. This watch comes in a range of different colours from light pink to black.